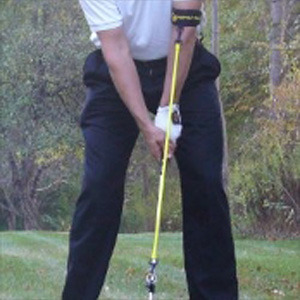 The Perfect Release is a patented and affordable golf training aid that uses a flexible cord connected between the golf club and lead arm. It quickly relaxes the grip, sets the golf club on plane, maintains a square clubface, induces the release of the golf club and promotes a positive body turn. Feel it to believe it and “Feel What the Pros Feel”. The Perfect Release works by using "Dynamic Technology". The underlying element of this technology is tension. The tension supplied by the specially designed cord actually takes the weight of the golf club out of your hands thus allowing you to relax your grip completely. This also leads to a more neutral grip. The release will be easy when you relax your grip. As well as promoting a relaxed grip, the tension of the cord creates the need for a solid alignment of your hands, arms and club head. If you have a breakdown in this alignment, you will feel it as well as see it immediately. Therefore it teaches you to maintain a solid/aligned position throughout the golf swing. Combining a solid alignment of your hands, arms and golf club with a relaxed grip, allows for and promotes increased clubhead speed, control, and a Perfect Release. If you have any questions regarding the Perfect Release Golf Training Aid, please give us a call, we would be happy to help you with any questions you may have. Write an online review on the Perfect Release Golf Training Aid, and share your thoughts with others.